Six year old Lewis Wilkie could not believe his eyes. The Queen. The actual Queen of Great Britain right there in front of him? He rubbed them again and again. But each time it was clear as day – Her Majesty Queen Elizabeth II really was there at the party celebrating his grandpa’s investiture as an MBE. Earlier last Wednesday Sandy Wilkie had lined up, at Buckingham Palace, with actor Hugh Laurie to be invested by Prince Charles after being awarded an MBE in the Queen’s birthday honours. 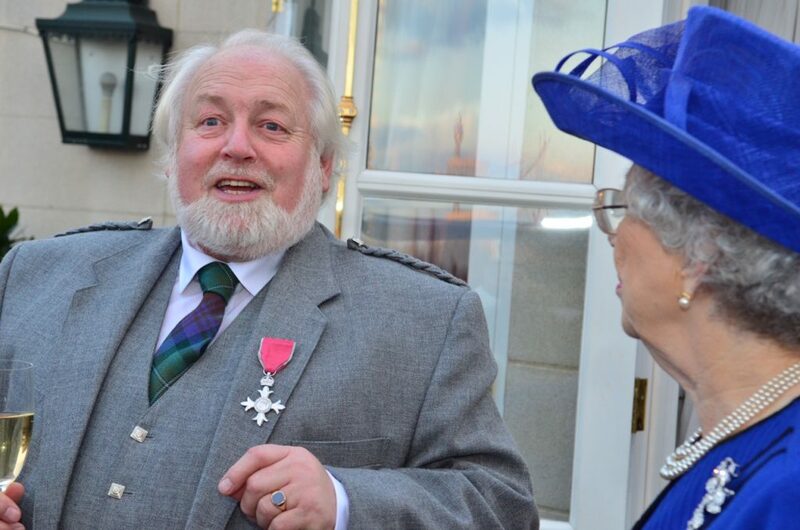 An array of family, friends and distinguished personalities, from the dairy and agricultural industries, had gathered to help Sandy Wilkie aka Alexander C Wilkie MBE celebrate his royal honour. It was not the first time he had met Prince Charles. On the previous occasion Sandy was not flavour of the month with the Prince, who is well known for his organic farming, having just returned from visiting a 10,000 cow factory farm in China. Sandy, is a larger than life character, who splits his time between Blantyre in Lanarkshire and his home at Kilchousland, Peninver and is a regular visitor to the Wee Toon, latterly in his four-wheel-drive smattered in cow pattern paint. Lewis wasn’t the only guest who was thrilled when the Queen walked into the after party at the Dorchester penthouse last week. Jaws literally dropped as Her Majesty serenely, aka look-a-like Mary Reynolds, toured the room, handbag, hat and pearls to the fore. But they shouldn’t have been surprised. For Sandy, in his pre-retirement role as sales and marketing supremo at Mueller Wiseman Dairies, is the man who put the milk moustaches on everyone from David Beckham to Bill Clinton. As well as black and white on just about everything.